Smart And Interactive Textiles Market size crossed USD 2 billion in 2015 and is likely to grow at a CAGR of more than 14% by 2024. Booming automotive industry and rising concern about passenger safety and comfort will catalyze the global smart and interactive textiles market in the coming few years. Growing consumer purchase power along with the trend for customization of personal vehicles will also have a positive impact on the industry. Low weight and comfortable fabrics with driver monitoring and control panels for activation of heated seats and air bags to upgrade the passive safety system are gradually gaining popularity among automobile manufacturers and users. Overall personal car sales reached over 65 million units with motor vehicle sensors generating revenue close to USD 20 billion in 2015. Regular innovations in the sector will promise a substantial growth in the global smart and interactive textiles market in the forecast spell. Sports industry require continuous monitoring of the player’s health condition by recording their heart rate, breathing rate, concussion, and other metabolic activities to ensure their safety during sporting events. Phase change feature of the specialty fabrics to maintain constant body temperature during rigorous exercising for enhancement of athletic performance and comfort will bolster the global smart and interactive textiles market. Global sports apparel market registered over USD 100 billion in 2015 and the introduction of sensor equipped clothing to ensure athlete safety will augment the global market growth in the coming years. On the basis of products, smart and interactive textiles market have been classified into wearable electronics, chromic materials, and others including geotextiles, self-cleaning textiles, anti-microbial textiles, etc. Wearable electronics are popular among the tech-savvy population and sports enthusiasts due to its easy connectivity with gadgets such as mobile phones, tracking devices, headphones, etc. These apparels are integrated with sensors and actuators to monitor the metabolism of soldiers, athletes, car and motorbike racers, and even cardiac patients. This segment accounted for a significant share of the global smart and interactive textiles market and has a promising growth prospect in the future years. Chromic materials segment of smart and interactive textiles market includes photochromic, thermochromic and others which includes piezochromic, electrochromic, solvatechromic, etc. textile materials which respond to external stimuli in form of light, temperature, pressure, electricity, or liquid and gas media respectively. These materials are sometimes also called chameleon fibers due to their ability to change colors in response to some stimuli. 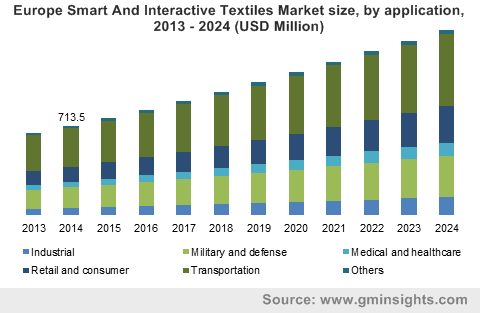 Smart and interactive textiles market application segments are transportation, military & defense, retail & consumer, industrial, medical & healthcare, and others including space exploration, leisure wears, etc. Transportation sector holds a significant chunk of the global market share registering over USD 750 million in 2015. It includes the application of the specialty fabrics in automobiles, aircrafts, railway coaches, ships, etc. to enhance the aesthetic as well as mechanical features. Increasing demand for light weight functional materials in aircrafts and automobiles to improve their fuel efficiencies will also boost the product demand. Growing concern for worker safety and along with inherent property of the product to adapt to ambient environment by the help of the integrated sensors will make the industrial application segment a fast-growing application sector for global smart and interactive textiles market in the coming years. Increasing industrialization in Asia Pacific region coupled with government regulations to improve operational safety in mines and industries will augment the growth. Europe smart and interactive textiles market accounted for more than 35% of the global share in 2015, but will rapidly lose its share to Asia Pacific and North America owing to the developing application sectors in these regions. Asia Pacific market will register growth at close to 20% CAGR due to the increasing industrial and automotive sectors in the emerging countries such as China, Japan, and India. Increasing defense expenditure in China and India will also boost the industry growth in the coming years. North America smart and interactive textiles market, dominated by the U.S., registered a revenue close to USD 700 million in 2015. Large scale advancements of military equipment and apparels for the U.S. army in order to enhance their performance and safety will boost the product demand in the region. In addition to military expenditure, increasing R&D works in the medical sector of the U.S. will also drive the regional market. Smart and interactive textiles market competitive landscape is highly fragmented with the top five manufacturing companies accounting to less than a fifth of the global share in 2015. Top product manufacturers include DuPont, Koninklijke Ten Cate, Toray Industries, Textronics, Inc, and Sensoria, Inc. The companies primarily focus on intensive research and development, product innovation, and application specific advancements to enhance their product portfolio and strengthen their market position. Presence of several other players intensifies the overall smart and interactive textiles market competition with several intellectual property rights being purchased by them. Multinational conglomerates such as DuPont and Toray exhibit a backward integration across the product value chain by developing the raw materials to ensure premium product quality. Among other smart and interactive textiles industryplayers, there are Milliken & Company, Globe Holding Company LLC, Interactive Wear AG, Indorama Ventures Public Company Limited, Schoeller Textil AG, Outlast Technologies LLC, D3O Lab, EXO2, AiQ Smart Clothing Inc, and several others. Smart and interactive textiles market is highly technology oriented and aims at providing sensing ability to the apparels in order to respond to the surrounding temperature, pressure, light, etc. The products are used to provide monitoring, safety, entertainment, and healthcare benefits to the user. Increasing number of tech-savvy population and development of new products to meet specific customer demands. Growing acceptance of the product advantages and increasing investments in the military and sports segment to provide adequate safety to the personnel will have a positive impact on the market.